Though Hong Kong can sometimes feel small, a weekend retreat to one of the outer islands, a break in Central, Kowloon or a hop across to Macau can be all the rest you need. We round up the best Hong Kong staycations for your next break. Pitching itself as a retreat for the body, mind and soul, Sommer Life Beach Retreat sits right by the water with its own private beach just past Silvermine Bay beach in Mui Wo. The work of life coach Nathalie Sommer and her partner, Matt, the property offers more than just a place to stay, with personal coaching sessions and organic vegetarian breakfast, lunch and dinner on offer as part of the package (room only is also available). There are two spacious double bedrooms available for rent, both with en suites, along with an open kitchen, lounge and dining areas, plus a large stone courtyard and a French bulldog called Jolie. If you're looking to escape the city, this is the perfect spot. Prices from $1,100 per night, or $1,900 all-inclusive. Sommer's Life Beach Retreat, 34 Tung Wan Tau Rd, Mui Wo, Lantau, 5501 8633; nathaliesommer.com/sommerlife. If you're looking for the full holiday resort experience, the Auberge has you covered. This 325-room hotel is situated in Discovery Bay's North Plaza and features a range of facilities including a 25m outdoor pool, fitness centre and spa. Accommodation comes in four room types and six suites, from the 322sq ft Mountain View room to the Ocean View three-bedroom deluxe suite. Expect king-size beds and 40in flat screen TVs, along with sunken baths in some rooms and stunning views. There's a restaurant and sports bar on the property and a range of other options just a short walk away in North Plaza. Prices start from $990 per night (inc tax) for the Mountain View room.Auberge Discovery Bay, 88 Siena Ave, Discovery Bay, Lantau, 2295 8355; aubergediscoverybay.com. The tiny island of Cheung Chau only has one proper hotel – the Warwick – though this little B&B, just a short walk from the main restaurant strip, is a fun alternative. With three buildings, two on Tung Wan Road, and one on Pak She Street, there are a total of 25 rooms (some bigger than others). The superior, deluxe, Vienna and family rooms all have their own bathrooms (standard rooms have shared facilities) and double beds. There's also a group room with bunk beds for up to eight people. There's a roof terrace and a restaurant and bar on the ground floor, with the choice of Cheung Chau and its beaches on your doorstep too. Prices from $650 for a standard room, though we recommend opting for the Vienna rooms, from $880. Cheung Chau B&B, 12-14 Tung Wan Rd, Cheung Chau, 2986 9990; bbcheungchau.com.hk. Tin Hau is fast becoming a hub for good eats, particularly Indian and Japanese restaurants at reasonable prices. The Somerset Victoria Park is conveniently located just outside the throngs of Causeway Bay chaos and a five minute walk from Tin Hau MTR station. Made up of 68 studio and one-bedroom serviced apartments decked out with contemporary furnishings, all rooms come with a complimentary handyphone for non-local visitors as well as WiFi, an en suite bathroom, a kitchenette with crockery, utensils and a microwave, a washer and dryer combo - more than a lot of Hong Kong apartments! A home away from home, Somerset Victoria Park is a perfect place for business and leisure travellers, or just for a cheeky staycation! Prices start from $750 for a studio room. 118 Electric Rd, 3653 8088; somerset.com. If you're looking for some serious highs from your staycation, the Ritz-Carlton is a good start. Located from the 102nd to 118th floor of the 484m-tall International Commerce Centre building, the views from any room are pretty spectacular. There are a range of grand and deluxe rooms, suites ranging from 800sq ft to 4,460sq ft and a club floor with its own private lounge. The hotel also features an infinity pool on the top floor, a fitness centre, a range of top restaurants and Ozone, which, at 108 floors up, is the highest bar in the world. Prices from $3,927 per night (inc tax) plus special birthday offers for HKID holders until Dec 2015. The Ritz-Carlton, Hong Kong, 1 Austin Rd W, Kowloon, 2263 2263; ritzcarlton.com. Located on the steep staircase-like Pottinger Street in Central, this new hotel channels the area's history into its boutique charm. 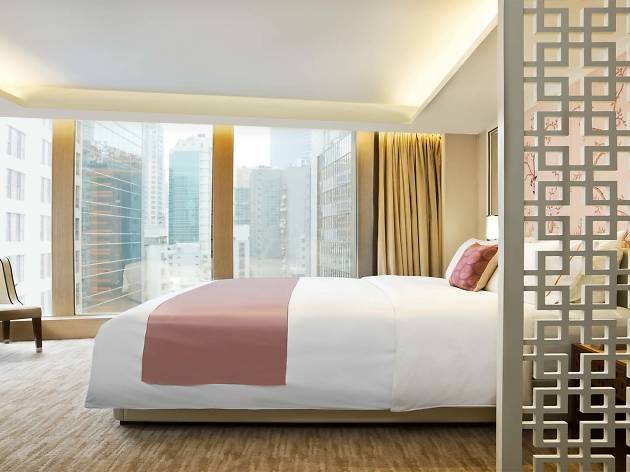 Named after Sir Henry Pottinger, the first Governor of Hong Kong, this 68-room hotel includes six suites, plus the signature Pottinger suite, each featuring full marble bathrooms, 300-thread count linen and elegant furnishings. The hotel is also home to the stunning Italian restaurant Gradini, the bar Envoy and chocolate shop Venchi. Prices start from $1,756 per night (inc tax). The Pottinger Hong Kong, 74 Queen's Rd C, Central, 2308 3188; thepottinger.com. Considered a modern institution in Hong Kong's hotel scene, the Grand Hyatt has been offering luxury accommodation since 1989. Situated right next to the Hong Kong Convention and Exhibition Centre it's a popular spot for business travellers. But thanks to its Plateau spa and outdoor pool, not to mention its range of top class restaurants, which include the Steakhouse, Italian restaurant Grissini and Kaetsu Japanese restaurant, as well as the elegant Champagne Bar, it appeals to those of us who are not in town for work. Prices from $2,640 per night (inc tax). 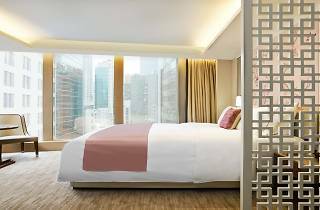 Grand Hyatt, 1 Harbour Rd, Wan Chai, 2588 1234; hongkong.grand.hyatt.com. Based in Macau proper, the MGM has become a prominent part of the city's skyline thanks to its distinctive bronze, silver and gold tower. The 35-floor, 600-room complex opened back in 2007 and boasts some of Macau's most artistic attractions. The hotel's gallery has been home to a range of exhibitions, from Chinese sandalwood sculptures to Botticelli's Venus, and currently the large central atrium is home to a gigantic textile piece by Portuguese artist Joana Vasconcelos. Rooms range from the grand and grand deluxe up to the lavish one- or two- bedroom villas. And of course there's a variety of restaurants, a gym, spa and rooftop pool to aide your relaxation. Prices from $2,237 per night (inc tax). MGM Macau, Avenida Dr Sun Yat Sen, Nape, +853 8802 3838; mgmmacau.com. This giant suite-only resort comprises over 3,000 rooms, a shopping arcade, a full range of restaurants, a 13,500-capacity performance arena and a theatre. Not to mention the spa, gym, swimming pools, mini-golf and gondola rides. The suites range from the 755sq ft royal, up to the 3,830sq ft two bedroom cielo with its own spa room and a limousine transfer included. Prices from $1,528 per night (inc tax). The Venetian Macao, Cotai, Taipa, +853 2882 8888; venetianmacao.com. The newest hotel on the strip, the JW Marriott is part of the phase two development of Galaxy Macau, along with the Ritz-Carlton. With a total of 1,015 rooms, this is the largest JW Marriot in Asia, and on top of the deluxe and premier room types, offers a series of retreat rooms and suites away from the hustle and bustle of the main resort that feature plunge pools and whirlpools in their private patios. Within the Galaxy complex there are more than 85 restaurants and bars to choose from, as well as an ESPA spa, cinemas, theatres and the Grand Resort Deck, with the world's largest Skytop wave pool, real white sand and water rapids. The special opening offer has prices from $1,596 for bookings made before June 30, for stays until August 31. JW Marriott Hotel Macau, Galaxy Macau, Cotai, Taipa, +853 8886 6888; marriott.com. If a day-trip to Ocean Park never feels enough, soon you'll be able to stay at its very own hotel. The Ocean Hotel was originally scheduled to be operational in 2013 but due to delays is now set to open in 2017. The 495-room property is due to be operated by Marriott and will be sited at the park's main entrance. A second hotel, The Fisherman's Wharf Hotel, is also in the planning. oceanpark.com.hk. On the site of the demolished New World Centre in TST, New World Hospitality (Rosewood's parent company) is building two hotels, the first of which is the new Rosewood Hong Kong. The 63-floor 600-room property is due to open in 2017, as will the second, currently unnamed property. rosewoodhotels.com. Further along the waterfront in Hung Hom is another new development that will include shops and restaurants alongside a new Shangri-La hotel. The luxury hotel, planned to open towards the end of 2016, is slated to rise to 18 floors and offer 599 rooms. shangri-la.com.